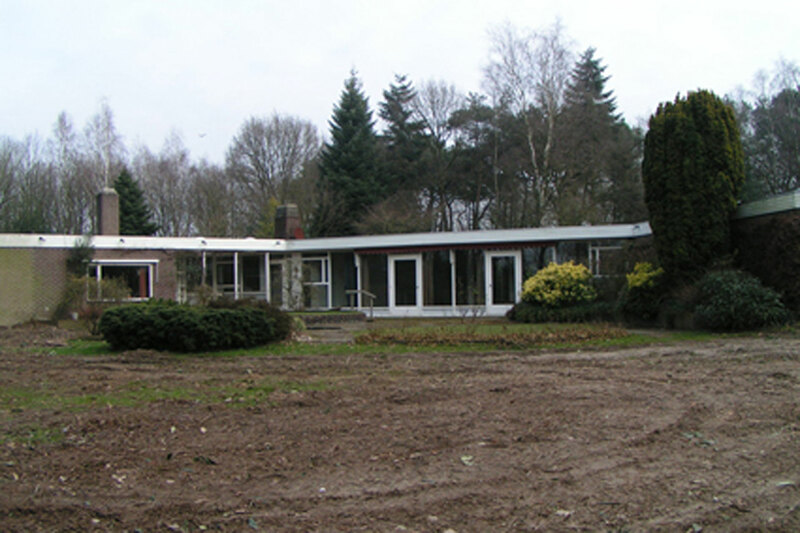 Villa De Mast was a languished bungalow, built in the sixties, consisting of two wings with a triangular living room in between. The new owner wanted a modernised, bigger house, without any triangular forms. The bungalow had to become twice its size. Because the existing height and outlines had to be maintained, digging was necessary. One wing was dug out completely, so that a lowered ground level was created. The original level was lowered to create higher rooms for living on the ground floor. With a void, which crosses the house, daylight can enter the house deeply. The two wings of the original, triangular room have been pulled apart, the new rectangular living room has been placed in between. This shape has been particularized by a white, steel panelling, that forms the frame of the lounge terrace outdoors. For the villa solely three materials have been used: glass, concrete and a natural stone for the façade. All details are invisible, so that very pure forms have been created. The concrete steps of the stairs seem to float, and the glass is embedded in the floor, without visible elements that hold the glass. This project was awarded the “Welstandsprijs Noord-Brabant 2008”.